Early this month, when every app developer was rushing to submit their new app updates for iOS 7, Readdle released Calendars 5. Calendars 5 is an all new Calendar app from Readdle that aims to replace your calendar and reminders apps. So what sets Calendars 5 (henceforth C5) apart? Well, for one, it is a Universal app. It looks great both on your iPhone and your iPad. Readdle has been known to do great pro apps for iOS and Calendars 5 is both flexible & beautiful. When it comes to Calendar apps, two things are important — Event entry and the main calendar view. C5 has quite a few options for the main interface. On launch, you are prompted to either login with Google Calendar or let the app access your local calendars stored on the device. There is a whole lot of white and very light grey shades in the app, with blue being used to highlight selections. Navigation is done with the buttons on the corners of the screen. You can view your events as a list, day, week or month on the iPhone by tapping the hamburger button on the top right. The whole interface of the app is styled to look great on iOS 7 even though there are some shenanigans at play. More on that later. The iPad has a year view as well, which is great looking and useful for planning a trip. Days with no events are white while days with events are highlighted with colors that can be seen in the app icon. Panning across your calendar is extremely easy because you can just about swipe anything in the app to move across days. There is also a row at the bottom of the screen that you can swipe. Getting back to today is easy and can be done by tapping the Today button on the bottom right of the iPad or the navigation bar on the iPhone. C5 has a lovely popover for event details when you tap a day or an event. Entering events into a calendar app should be as quick and painless as possible. Fantastical has nailed this and even an app like Agenda allows you to use the super fast and awesome Fantastical parser for events. C5 has its own system for natural language input and I found it to be good but not as good as Fantastical. It borrows heavily from the visuals used in Fantastical for event entry. The in app settings gives you a wealth of options like Time Zone control, View options for when your week starts and app launch, and even the ability to link your iOS reminders to the Tasks section of the app. The Tasks section in C5 is a bit like a Getting Things Done app with an Inbox to collect your ideas or tasks among other things. I love having the ability to tap and hold and then drag a task directly into another category instead of manually having to edit it like some other apps. Calendars 5 is a great calendar app that almost does everything you want it to. It has an elegant interface and features people need in a calendar app. However, I completely abhor the fact that the App Store screenshots for Calendars 5 show the new iOS 7 keyboard and status bar while the app still has the old, iOS 6 ones. This is blatant false advertising. The app video has the correct app but a few updates in, the store screenshots are still incorrect. I hope they actually build the app for iOS 7 in an upcoming update and have the screenshots corrected till then. 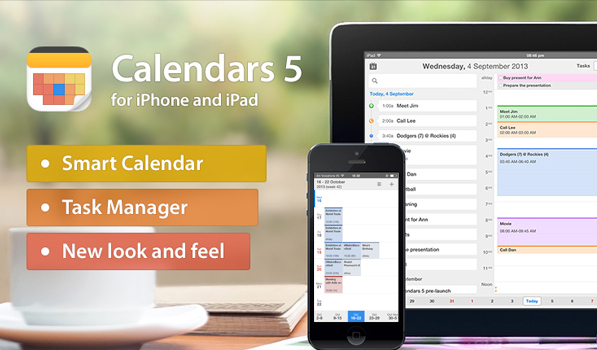 Calendars 5 is available on the App Store as a Universal app for $6.99.